Okay, if you started this tour at the beginning and you're still with me, I hope I don't lose you here. I created this tour in 2003 so that the executives at Warner Brothers could see every detail of the car because I was helping them get all the details of their movie cars right. They didn't do too bad. Anyway, they needed to see the mirrors, so you also get to see them. Frankly, they're worthless. They are just too small and the sides of the car stick out too far. 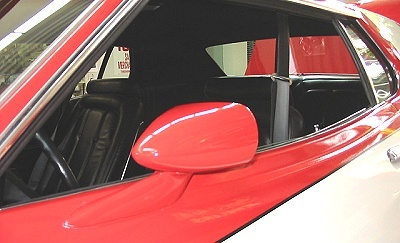 I wonder if that's part of the reason they switched to rectangular chrome mirrors after the first season of the TV show?